Marvel and DC have been like a pair of feuding brothers. They snipe at one another, they take cheap shots. Sometimes they even get into outright brawls. However, they sometimes share their toys. 1976 brought Marvel and DC’s best known properties into conflict and cooperation: Spider-Man and Superman. It was a work that figured both existed in the same universe, and 1981’s subsequent sequel would do the same. The same applies for the same year’s Batman vs Hulk, and 1982’s seminal work X-Men and Teen Titans. You know, the one where Darkseid brought the Dark Phoenix back from the grave, and the Teen Titans figured the X-Men were the ones at fault. And it ended with Cyclops shooting Darkseid with his first Phoenix possession. It was really awesome. Unfortunately, inter-office politics wound up messing with a pending JLA vs Avengers crossover, and it would be shelved until a miracle occurred in 2003. However, some magic would be worked to bring the two companies together in 1996. I did my best to find out why, but there isn’t much of a history out for this event. Best I can tell, both comics companies wanted to inject some hype into their sales, and it worked. You see, the big thing about this issue? The fans could decide who wins or loses. To bring up the hype, Marvel and DC began to team up once more in specials in 1995. Galactus tried to devour Darkseid’s home world Apokolips. Green Lantern and the Silver Surfer teamed up to take on Thanos and Parallax. At the end of that story, a cardboard box in an alleyway began to erupt with light. Cutting ahead a few months, Marvel vs DC (or DC vs Marvel) #1 came out. The same cardboard box was still erupting with light, this time with the light striking several key figures in the worlds of Marvel and DC. Characters began to cross over between both universes, with amusing and hilarious interactions. Superman vs Juggernaut. Batman vs Bullseye. Robin flirting with Jubilee. Venom vs Batman. A personal favorite was when Gambit and Wolverine jacked the Batmobile out from under the nose of Batman and Nightwing. At the end of the issue were two things, however. The first was that the two incarnations of Marvel and DC themselves decided that only one could remain, and it was a battle to the end. Only the winning universe would survive. The other? A ballot. While six of the eleven fights would be decided by the writers, five belonged to the fans. Batman vs Captain America. Hulk vs Superman. Superboy vs Spider-Man. Wolverine vs Lobo. Wonder Woman vs Storm. You could mail in the ballot, take it in to your local comic shop, or even use an AOL e-mail to vote for your hero of choice. In retrospect, the reason Marvel and DC gave only five fights to the fans was so that the writers could fudge the fights in favor of neither side winning. What resulted was an arbitrary, yet awesome, duel for the ages. Flash would edge Quicksilver out in a race and brawl. Aquaman would literally crush Namor the Sub-Mariner with a whale. Thor (in an outfit that was never used in his main comics) would duel Captain Marvel (now known as Shazam). Silver Surfer would also barely edge out the Kyle Raynor’s Green Lantern. Robin would tie up Jubilee. Electra tossed Catwoman off a skyscraper. All of these stories were fast-paced fan-favorite brawls, and all decided by editorial. When it came to the fan-votes, however, things would be controversial. Wolverine and Lobo’s fight would be found in the favor of the Canadian brawler. Wonder Woman would fall to multiple lightning strikes from Storm. Spider-Man would (somehow) defeat Superboy. Superman would knock out the Hulk in a massive brawl. Captain America would (barely) lose to Batman. With the final fights done, and DC having lost 6-5, that was just about it for DC, right? Wrong! With an 11th hour twist, Marvel and DC decided that neither universe should end, and instead the age of Amalgam would begin! Original character Access, who would be a joe who has “access” to both Marvel and DC’s realms, would force both realities to combine into one, aided by both the Living Tribunal and the Spectre. Twelve comics would be released with a theme of blending one DC property with one Marvel property. Wolveine and Batman would blend to become the hilariously over-the-top Dark Claw, while Superman and Captain America would mix to become the Super Soldier. Spider-Boy. Speed Demon. The Amazon. Doctor Strangefate. Bruce Wayne: Agent of SHIELD. The X-Patrol and the JLX. The results would be so hilariously over the top and stupid fun that it was hard to believe both companies knew what they were doing. Finally, issue four would be released, and the worlds would un-merge into their respective counterparts. The two incarnations of Marvel and DC would shake hands and part their ways for the time being. Ron Marz and Peter David would share writing duties on this special, and it really shows. Dialogue is snappy, and references fly all over the place. The Joker references the one time he met the original Spider-Man, J Jonah Jameson and Perry White are two sides of the same coin, a demigod like Wonder Woman is considered worthy of Thor’s Hammer, and it just goes on and on. While it could have been a cheap cash-in with some joe schmoe writing the comic, Marvel and DC went all out, and it shows. Art was… complicated. Dan Jurgens and Claudio Castellini took turns on 8 page spurts of the story, sharing penciling credit. Paul Neary and Josef Rubinstein would do the same, creating solid looks for both the Marvel and DC universes. Gregory Wright wound up doing colors for both sides, making it feel uniform, and Bill Oakley worked on lettering. The whole book, as you can see from the above pages, is hyper-muscled and ridiculously 90s. It really works well for the story, but it’s also worth reading for some highly frantic and action-packed art. This crossover would have lasting effects in some regards. Regular crossovers between DC and Marvel would be released until 2003’s JLA/Avengers crossover. 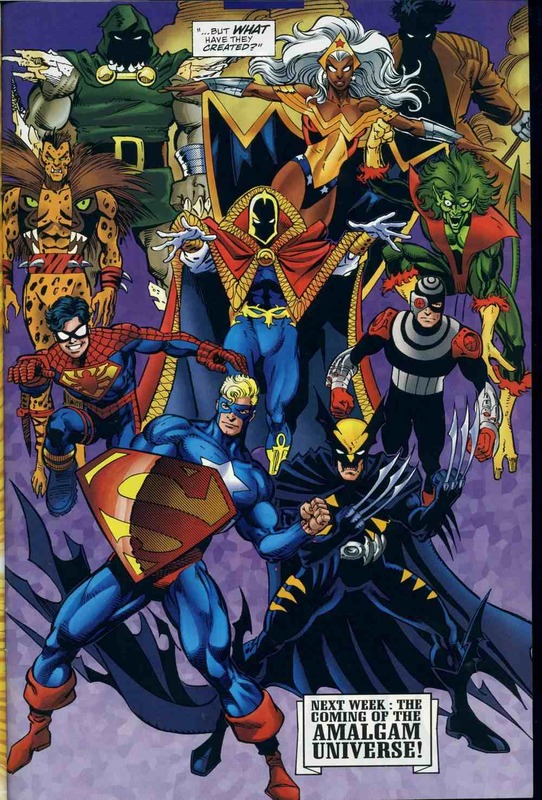 Two mini-series featuring the original character Access would push the crossover concepts for a few years, resulting in a second Amalgam event for a week. Pretty much all of those stories are worth reading just for the charm and gimmick, especially with Marvel and DC putting the best of their staff on those books. The real problem is that all of these issues are now long out of print, and any graphic novel put out by the pair of publishers to cover the event now run for incredibly high prices on the secondary market. Individual issues range from being found in the quarter bin or going for upwards of thirty bucks on eBay. Sadly, Marvel and DC have not seen fit to put them out digitally, or republish them in recent years. If you’re into 90s nostalgia, it’s a perfect book to pick up if you can afford it. Next time, we launch into the last of Marvel’s experimental events of the 1990s. Onslaught is coming. Are you prepared?